A smaller, but deeper print. How tall must this guy (or girl) have been? Its our last full day in the Sheridan Wyoming, and we’re headed for Red Gulch Dinosaur Tracksite. The tracksite is a congregation of fossilized dinosaur footprints in the wilds of Big Horn County, near Shell, Wyoming. 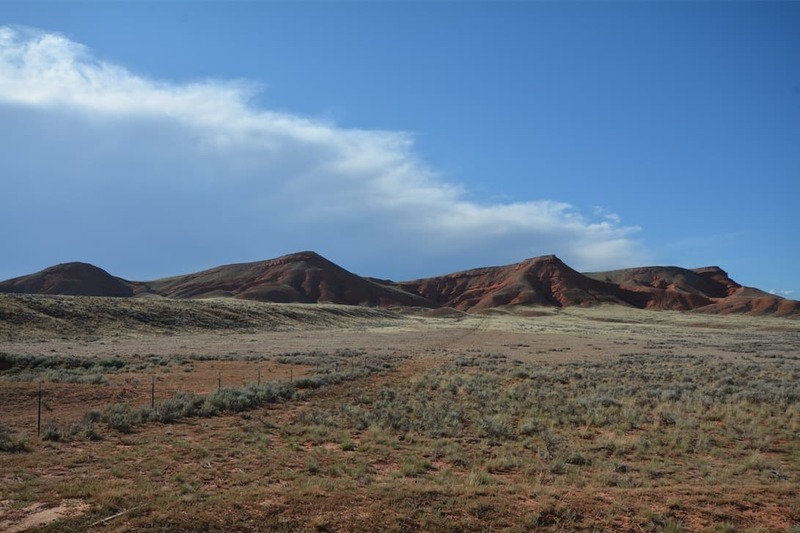 The site is located on BLM land along the Red Gulch/Alkali Scenic Backway. 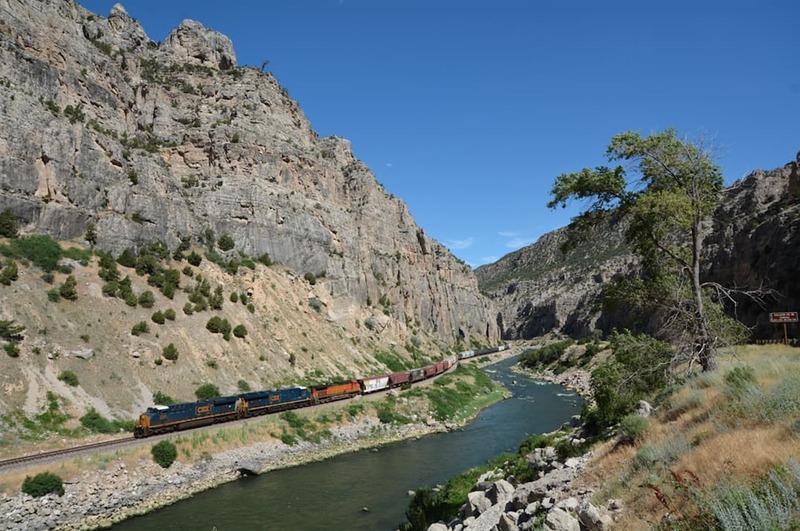 The Red Gulch/Alkali Scenic Backway is a 32-mile route that winds through some of the most remote and desolate sections of the Big Horn Basin. In addition to Red Gulch Road (BLM Road 1109), the route also travels along Alkali Road (County Road 1111), before dumping you out in Hyatville. Hyatville is a tiny rural community with no services to speak of, but certainly a friendly neighbor, or two, to greet as you pass through. It’ll take us about 3 hours (including stops) to get from Sheridan to the start of Red Gulch Rd. Then another few hours to explore the dinosaur tracksite and the route, itself. 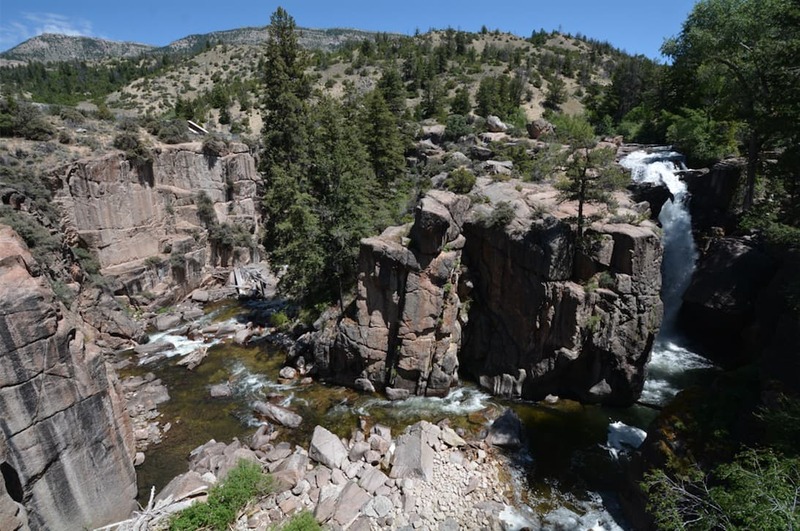 Our first stop was inside of Bighorn National Forest at Shell Falls, inside of Shell Canyon. The falls are located on highway 14, about 11 miles east of Shell, Wyoming. We spent a half hour, or so, exploring the small boardwalk loop and learning in the interpretive center. Afterwards, we made our way down the canyon, through Shell, toward the start of the Red Gulch Road. 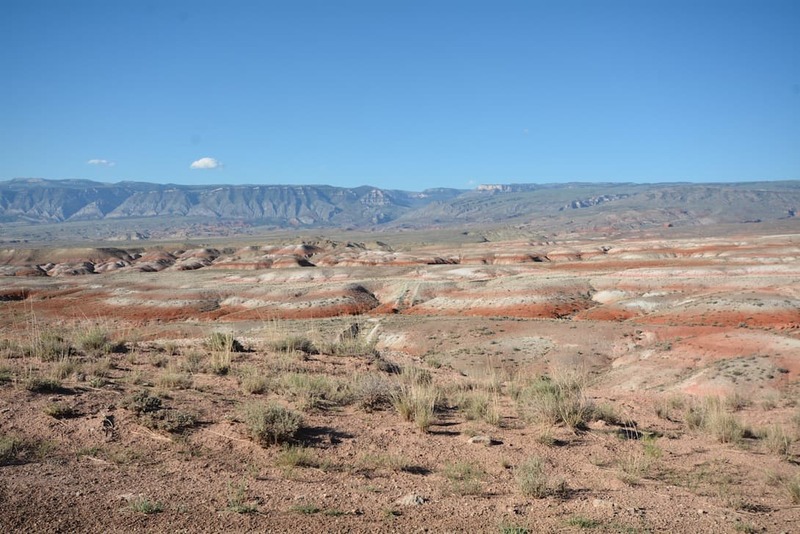 We traveled for about 20 minutes along Red Gulch Road before we reached the dinosaur tracksite. A Train Runs Through It. Shell Canyon in Bighorn National Forest. The Red Gulch Dinosaur Tracksite was discovered only in 1997. Its the largest dinosaur tracksite in Wyoming, and is actually unique in the world. 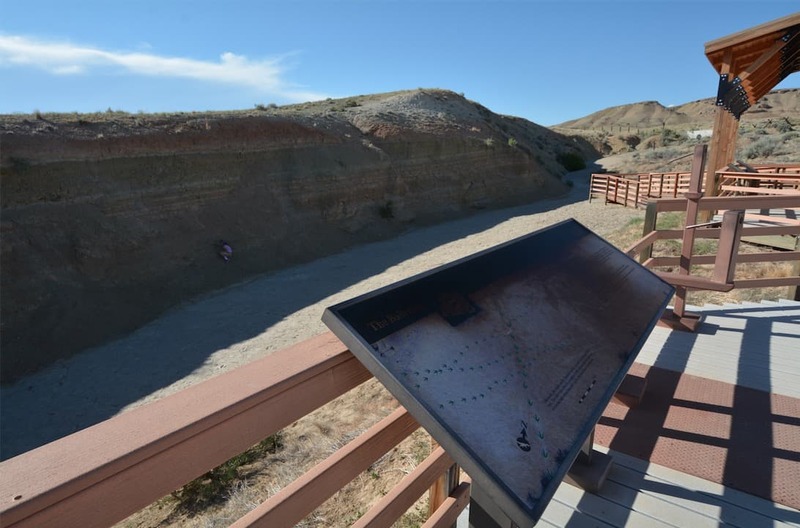 According to the Wyoming Scenic Backways brochure, the site is one of only a handful, worldwide, which exhibit fossils from the Middle Jurassic Period (160 million to 180 million years ago). A beautiful facility. Can you spot the Junior Ranger in this photo? Because so few similar sites exist, the types of the dinosaurs that made the tracks at Red Gulch remain a partial mystery. Several kinds of dinosaurs were likely present at the time the tracks were made. 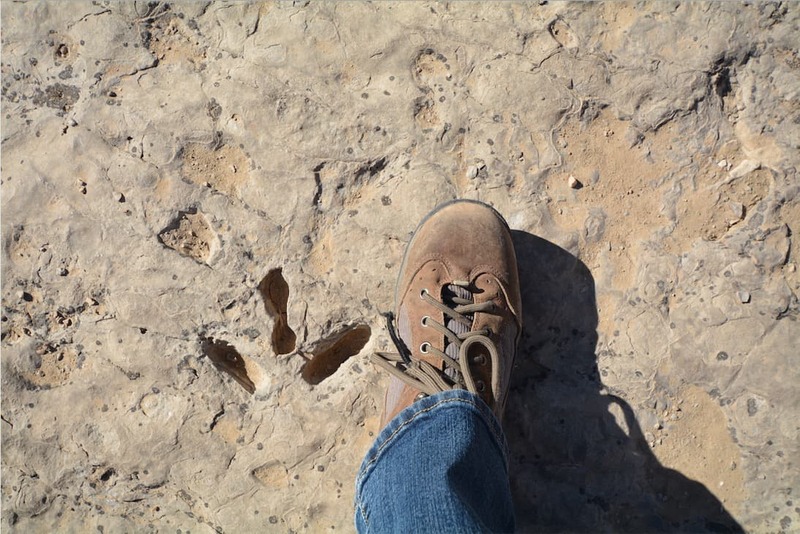 Scientists believe that the footprints may have been made by meat-eating dinosaurs, called theropods. They walked on their hind legs, hence the single-print tracks. What a blessing it has been to explore this site, and dozens more geologic exhibits, in Wyoming and across the US West. Learning with our children within a four-dimensional classroom. The fourth dimension is, of course, time. Today, we’re having time, two ways (thank you, Chopped). There is the largely-unfathomable geologic time which we see splayed out in front of us. 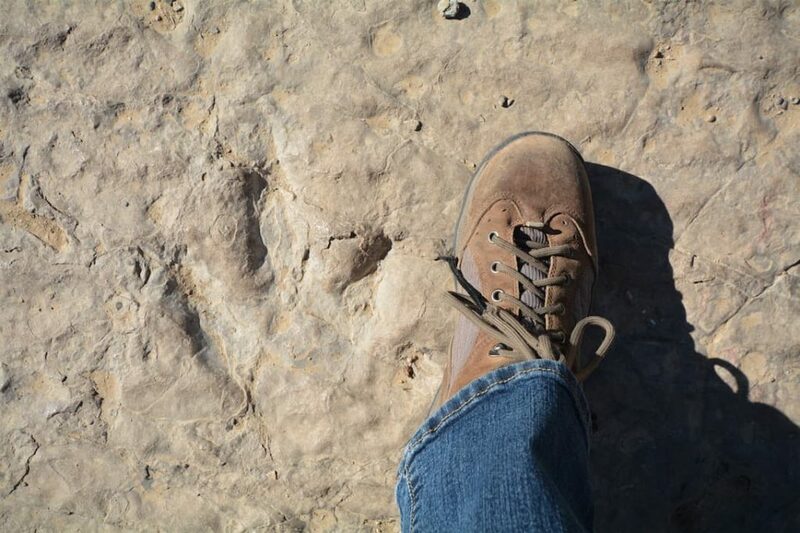 Not only in the dinosaur tracks, but in the rock in which they’re imprinted. Rocks in every direction, which have been uplifted and eroded over countless millions of years. But then there’s hiatal time (i.e., born of hiatus), which we’re able to experience because we did something as ill-advised as break out of ‘9-to-5’ to travel the world with our kids. Not a bad swap-out, if we do say so ourselves. And you? Are you missing out on critical time? Geologic, hiatal, or otherwise? Is there an experience of life that you’re missing because you’re working too hard to have it? Are you willing to trade in your 9-to-5 lifestyle? And if so, what’s your price?